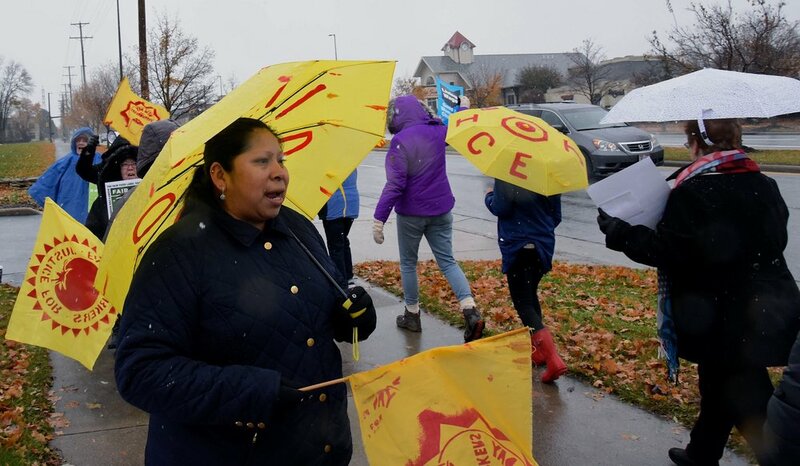 Photo Report: CIW & United Methodist Women leaders from all over the country convene outside of Wendy’s Headquarters! The delegation of United Methodist Women, local Columbus area faith leaders and students outside of the Wendy’s HQ. 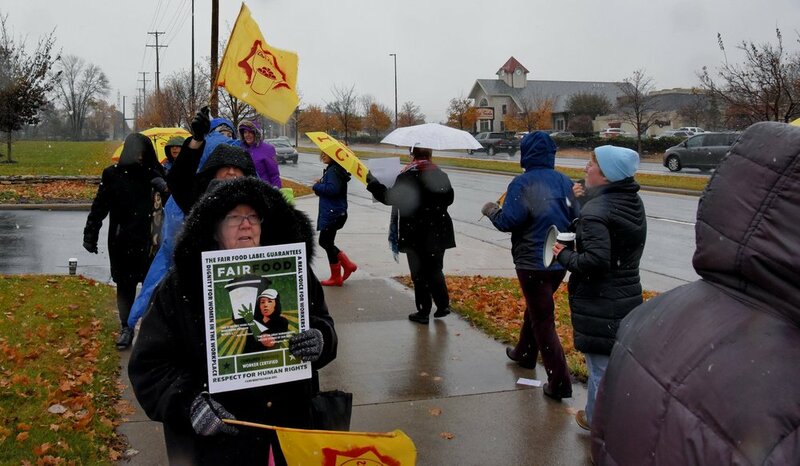 From the months of September and October the United Methodist Women joined the National Farm Worker Ministry and the CIW to call on Wendy’s to join the Fair Food Program. Throughout the past months, they collected signed postcards to petition that Wendy’s join the program. Leaders began the day by convening at St. Stephens Episcopal Church, a congregation that has been longtime supporters of the CIW. United Methodist Women leaders from Florida, Ohio, New York and other local Ohio faith leaders connected with Lupe Gonzalo from the CIW and had the opportunity to learn and ask questions about the expansion of the Fair Food Program and the latest updates in the Wendy’s campaign, including Wendy’s move to purchase from greenhouses in the US and Canada. In addition, the United Methodist Women delegation shared information about their Living Wage for All campaign, an action initiative aimed at ending economic inequality, and how that drives their work with CIW for a living wage and dignity for farmworkers. Students from OSU also joined the group for breakfast to talk more about the history of the Wendy’s campaign on campus and what they see as next steps moving forward. 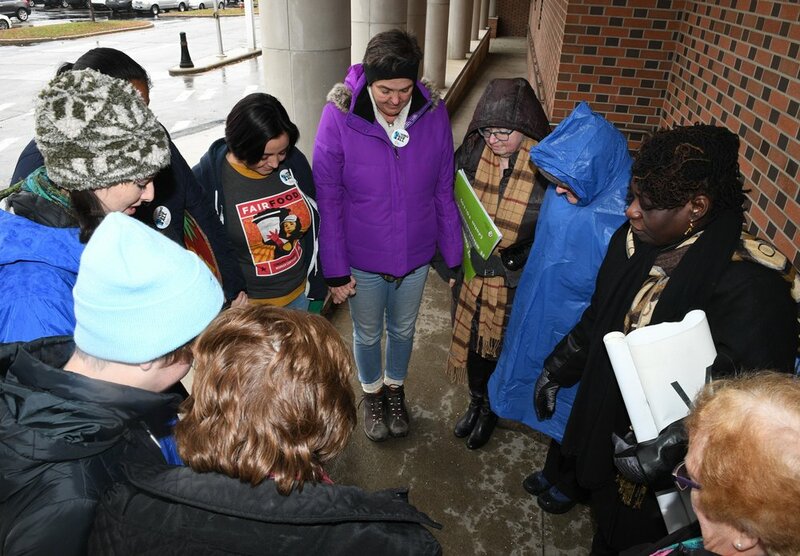 To kick-off this eventful day, the powerful group led a public prayer outside the Ohio State University while the Board of Trustees, President Drake included, were meeting to discuss OSU academic and student affairs. Students at OSU have been demanding a dialogue with President Drake for over four years to no avail. In order to make sure our presence was felt and our demands heard, students and allies went inside the trustee’s meeting, passing out flyers and postcards. Since Wendy’s did not allow us to deliver the letter and given that at this same moment they were receiving over 5,000 postcards in the mail we ceremounisly signed a magnified version of the postcard. After everyone signed their name, Lupe Gonzalo from the CIW shared her final words of the evening. “All of us who are here, are looking for change. We will achieve this change by uniting, the change will be achieved shoulder to shoulder, not I as a farmworker not all of you as faith leaders, but together in this struggle for a better world.” She continued to share our persistance in being outside in the freezing rain and how farmworkers too face harsh working conditions. She closed the day by speaking to how we will unfreeze Wendy’s stonecold heart.